Mold Inspection Corona CA. 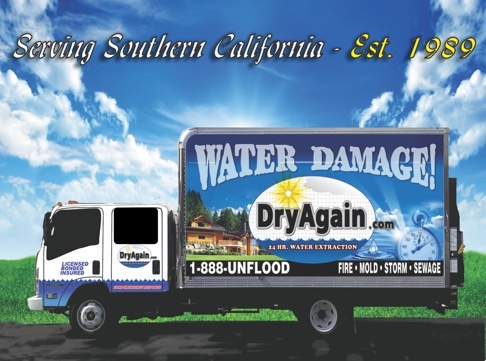 Call DryAgain Water, Mold and Fire Restoration Services At (909) 337-7900. Mold infestation is a serious matter that can become much worse if not taken seriously. If there’s any suspicion of mold growth in your home, contact (909) 337-7900 for a free estimate on mold inspection. If mold is left untreated, it can become a serious issue very quickly. It causes major health risks and it can cause major structural damage to your home or other property by warping walls, floors, ceilings, and the foundations. Sometimes you can see mold, but sometimes you can’t because it hides behind walls and underneath floors. Some signs you may have a mold problem include cold type symptoms that won’t go away – itchy eyes and throat, coughing, skin rashes, nausea, and vomiting. These are just a few indicators that mold may be present. DryAgain Water, Mold and Fire Restoration Services’s mold inspection crews will not only remove the mold damage from your home – they will also make necessary repairs to your home to keep it from coming back. Our mold services also include whole home inspections to ensure mold doesn’t move to another area of your home. Contact DryAgain Water, Mold and Fire Restoration Services today to discuss your mold inspection needs. Mold inspection companies work diligently to find and remove mold growth in your home or other property. DryAgain Water, Mold and Fire Restoration Services confines the mold to one area by sectioning off doorways, windows, and vents with heavy plastic sheeting, then uses special cleaners and air machines to remove mold from the affected areas. Mold inspection is a very delicate process. Moldy materials that can’t be saved are carefully discarded. We double bag these items to ensure mold growth doesn’t spread through the home. Air inspections are also conducted to make sure mold growth has not returned. As part of the mold remediation process, DryAgain Water, Mold and Fire Restoration Services will also determine the cause of the mold damage and make repairs to keep it from happening again. Mold damage can occur for a variety of reasons from leaky pipes to ventilation problems. Again, the sooner mold inspection takes place, the better. Call the experts at DryAgain Water, Mold and Fire Restoration Services at (909) 337-7900 for more information today. If you’re asking yourself “So, why should you choose DryAgain Water, Mold and Fire Restoration Services?” Consider this. We are available 365 days a year for mold remediation services. DryAgain Water, Mold and Fire Restoration Services offers a variety of Corona mold-related services which include mold inspections, mold detection, air purifications, mold removal, and finding and fixing the source of the mold issue so it doesn’t happen again and again. Our mold inspection company has an experienced staff with licensed and insured mold remediation professionals. DryAgain Water, Mold and Fire Restoration Services uses all the latest technology and equipment to make sure that the job is done right the first time. Contact us today at (909) 337-7900 for a free estimate today!